Are you hooked on hops? Have you fallen in love with hazy East Coast IPA’s, or do you still crave the blast of hops you get with a West Coast IPA? It would be great to sip a Heady Topper or Pliny the Elder all the time, but those beers come with a stiff price tag. Many of the premium hop-bombs sell for $10 or more for a six-pack. Regardless of what you like in hoppy brews, they can be difficult to find on a budget. Difficult, but not impossible. 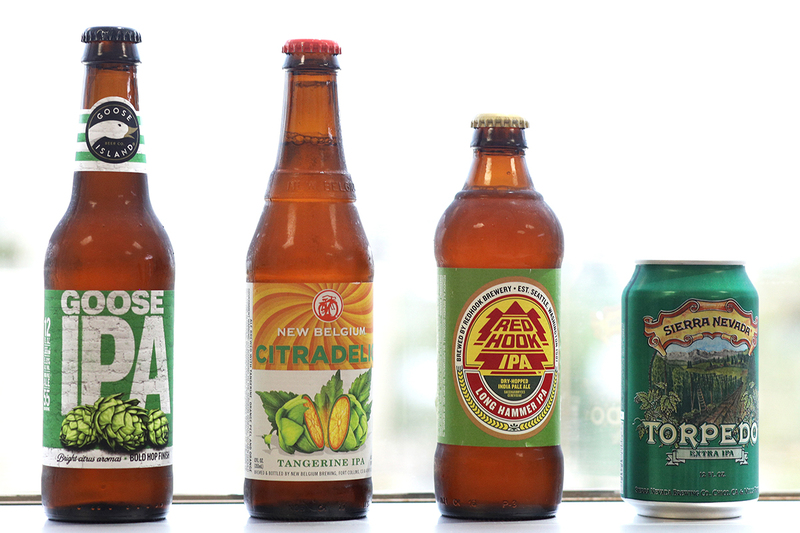 We’ve found eight great-tasting hoppy beers you might find for less than $8 per six-pack. We list each one along with its International Bitterness Units, which is a measurement of the bittering substances in the beer, on a scale of 1 to 120. Most IPAs range from 40 to 100 on this scale. Also noted are each beer’s alcohol by volume and Beer Advocate rating, which is on a scale of 1 to 100. The easiest beer to find on this list, Goose Island IPA is a solid value. There’s no need to get into the is-it-a-craft-beer debate due to it selling out to a larger brewer; if it’s a hop fix you’re looking for, this Chicago-brewed beer can bring it. It pours a straw-gold color and gives off an almost fruity aroma. Made with Cascade, Centennial, Pilgrim and Styrian Celeia hops, this beer is bright, crisp and pretty tasty. You can frequently find it on sale for $7.99 or less. Ananda is a golden gem out of Memphis, Tennessee. It’s a single-hopped IPA using the Bravo hop, which brewers don’t often use. Ananda pours a lighter yellow-gold and offers aromas of citrus and floral notes. With hints of orange and vanilla, this is a brew that offers a nice hop kick on the tongue. Ananda got its name from the Sanskrit word for “bliss,” so you even get a nice bit of trivia to wow your friends when you crack one open. I stumbled on this IPA on sale for $6.99 for a six-pack. Bonus: the can design is fantastic. Looking for something a little lighter but still has that burst of hops your palate craves? Flying Fish Extra Pale Ale is an American Pale Ale with a low 11.2 IBU score. While it doesn’t rate all that well on Beer Advocate, this New Jersey native does have bragging rights as the top-selling craft beer at Philadelphia Phillies home games. Pouring a light yellow, the creamy head on this beer gives off notes of barley malt and a hint of citrus. Flying Fish uses Palisades, Columbus, Warrior and Citra hops conservatively to create this easy-drinking APA. Look for it on sale at $7.99 or less. The good folks at the Oregon-based Full Sail Brewery make the laid-back Session IPA. Intentionally made to be lighter on the hops and the alcohol, Session IPA boasts two gold medals from the World Beer Championships. Not too shabby for a brew you can find for $7.50 or less per six-pack. Session IPA doesn’t brag about which hops it uses, so you’ll have to let your taste buds decide. In the glass, Session IPA is a deep gold with hints of copper. The aromas offer hints of pine with a touch of sweetness. With hints of orange and spice, this is an IPA for a hot day. You may need to live in or visit the upper Midwest to find this gem for under $8.00 per six-pack, but it does occasionally go on sale for less. If citrusy IPAs with a hint of tropical aroma are your thing, Summit Saga is your brew. This Minnesota gem uses some prime hops including Centennial, Amarillo, Citra, Rakau. Saga pours a clear orange and provides plenty of tropical fruit on the nose. With 80 IBUs, this IPA brings the hop bang that you’ve learned to love without breaking the bank. Sometimes you can find great deals on 12-packs, if you can scrape up a few extra bucks. From one of the Colorado breweries that launched the craft-beer craze comes this uber-juicy IPA. Citradelic pours a hazy gold and smells lightly of tangerine and citrus. Made with “tangerine-infused orange peel” this beer drinks light and easy. It’s not the choice if you’re into dank, piney hops. But for those who enjoy a citrusy IPA, it’s a rock-solid selection. You can frequently find New Belgium beers on sale for $7.99 per six-pack. Give this one a try. You won’t be disappointed. Long Hammer has been a mainstay on shelves for years. This Washington state staple is for those of you who love your Cascade hops. It pours a clear, amber color and provides citrus and pine notes on the nose. Long Hammer IPA is a hop-forward beer you can find at $7.99 or less. It’s a classic example of a West Coast IPA that’s worth every penny. What more can you ask for from a beer? It gets a 92 rating on Beer Advocate from users and a remarkable 99 from the BA brothers. At 7.2% ABV, it also has the most alcohol-content bang for your buck of any of the beers on this list. Torpedo pours a clear, copper color and smells of grapefruit and tropical fruits. It features Magnum, Crystal and Citra hops for a great kick with wonderful citrus notes. Few breweries are so closely associated with great pale ales as California-based Sierra Nevada. When it’s on sale, you can grab a sixer of Torpedo for $7.99 and find out for yourself just how good a budget IPA can taste. Don’t feel like you need to fork over $10 just to get your hop fix. There are great beers out there that pack a hoppy punch without charging an arm and a leg. This list is far from comprehensive. What you can find may depend on where you live. Support your small, local breweries when you can, but when you need to grab a six-pack on the cheap, keep your eyes open for these great brews. Tyler Omoth is a writer and blogger who loves soaking up the sun and finding creative ways to help others. He’s written about craft beer, career goals and many books for kids because he’s kind of a big kid himself.